The rates of smoking cigarettes among recovering alcoholics is three times that of the national average and research indicates that alcoholics are at greater risk for the negative health effects of smoking than other smokers. An estimated 21% of the general population smoke cigarettes, but among chemically dependent people, the rate jumps to 80% to 95%. Researchers agree that the rate of smoking among recovering alcoholics is more than triple that of the general population. Research also shows that because of the damage was done to the body by years of heavy drinking, recovering alcoholics who smoke are at a much greater risk of developing health problems related to smoking — particularly cancer and cardiovascular disease. Consequently, the death rate for alcoholics following treatment is 48.1% within 20 years, compared with only 18.5% for the general population. More than half of those deaths are attributed to smoking (50.9%) compared with 34.1% for alcohol. One reason few recovering alcoholics attempt to quit smoking is the belief that the stress of quitting smoking could jeopardize their sobriety. 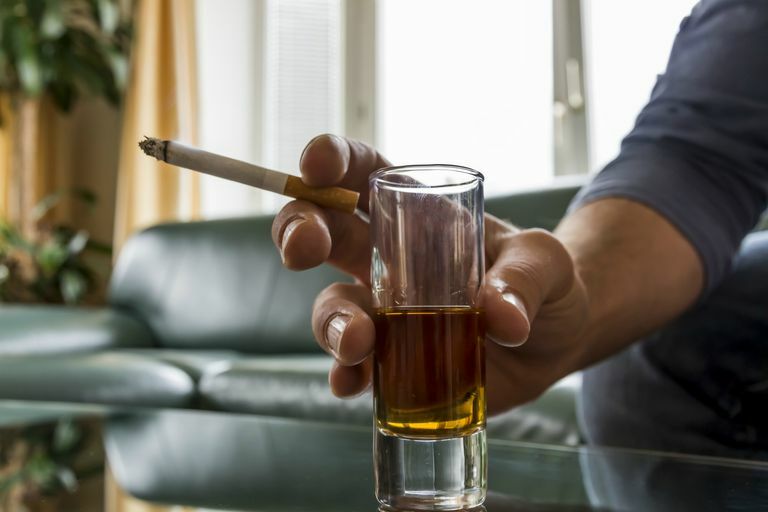 Few treatment centers require their patients to stop drinking and smoking at the same time, mainly because many of the people who work in the treatment industry are smokers themselves. Members of recovery groups are warned by other members to "take one addiction at a time," further perpetuating the myth. Scientific research, however, tells a different story. Several studies have found that quitting alcohol and cigarettes at the same time actually enhances the chances of maintaining sobriety. The reason, research shows, is because nicotine can increase the craving for alcohol, especially for those who always drank and smoked at the same time. Most recovering alcoholics know they need to quit smoking and want to quit. A survey of people in treatment for alcohol dependence found that more than 50% said they wanted to quit and two-thirds of them had actually tried to quit at least once. Typically, the main reason recovering alcoholics fail to quit smoking is because they try to do it on their own. Rather than using the same tools they used to quit drinking — medical treatment, professional counseling or support group participation — they try to quit smoking without assistance and often fail. According to Terry Martin, the Verywell.com Smoking Cessation Expert, the vast majority of people who smoke fervently wish they did not. Quitting is not easy, no doubt about it. But it begins with having the will to quit. Martin provides lists of the benefits of quitting. Experts agree that the key to successfully quitting is getting yourself prepared to quit psychologically — understanding the difficulties and preparing yourself to face them. Martin gives several tips on how to get ready to quit. The good news about quitting smoking is that you don't have to do it alone. There are quit smoking aids available to help and a world of support out there to encourage you. Thousands of people quit smoking every year, leaving their addiction to nicotine behind them and they immediately begin to see the healing process begin within the first 20 minutes of putting down that last cigarette. McIlvain HE, et al "Practical Steps to Smoking Cessation for Recovering Alcoholics." American Family Physician. Oct. 1998. Goldsmith RJ, et al "Towards a Broader View of Recovery." Journal of Substance Abuse Treatment March 1993. Can Smoking Worsen Your Back Problems? What Are the Risks of Hookah Smoking? Don't Let a Smoking Relapse Get You Down! Can Methadone Help Me Quit Heroin?